I guess you just thought: “No Peter, you made a mistake in that title”. But, I didn’t and soon you will realise why. The proverb you thought off is one of the indications that the patient, our society, is ill, seriously ill. We cherish safety and security, avoid risks. We seem not to realise that the road towards major innovations, results, successes, is a bumpy one. I bet you thought that I planned to use the proverb Better safe than sorry. A proverb that we use too often, mostly unconscious, which is even worse. The situation of the patient is rather critical. It’s wiser to be cautious and careful than to be hasty or rash and so do something you may later regret. But why would it be wiser to be cautious and careful? Let’s not be too hard on ourselves. Risk avoiding behaviour is something we have learned. If there’s someone to blame, it are our (grand)parents or their ancestors. They have told us what (not) to do during our socialization process. The main issue is that this socialized behaviour is nested deep in our system, it is hard to get rid of it. Last week on day 2 of infoShare Vladimir Vulic (@vulicvladimir) shared a real life story explaining this problem based on a powerful red deer example. A quarter of a century on, red deer on the border between the Czech Republic and old West Germany still do not cross the former “Iron Curtain” boarder. During the Cold War, electric fences made the Czech-German boundary impossible to pass. As you might remember many people who tried to pass this boarder got killed, regarding them we should feel sorry. The remarkable thing is that the average life expectancy for deer is 15 years and none living now would have encountered the barrier. Scientists believe that fawns tend to follow mothers for the first year of their lives and develop a pattern in their movements, so the same area remains the habitat for each new generation. 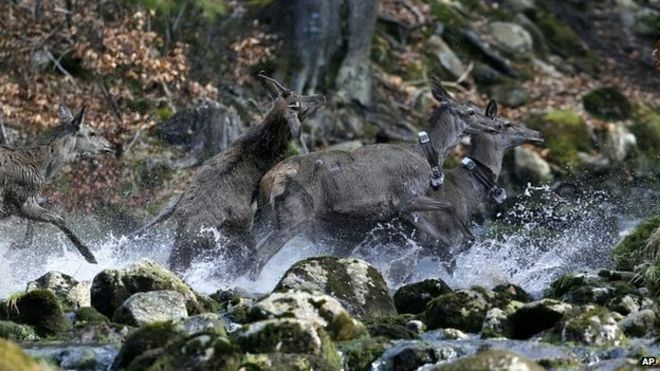 These deer seem to be very conservative in their habits (source: BBC, Czech deer still avoid Iron Curtain). Similar things happen to us human beings. Just like the mentioned deer, in many situations we will adjust to accepted behaviour, stick to agreed standards, etc. It makes life predictable and the majority seems to prefer such a life. Entrepreneurs in general do not accept that status quo. They know that it is better to “fail fast”, although that shouldn’t become a goal in itself. This right to explore things is not limited to entrepreneurs alone. I would like to invite you to find out what boundaries you would not cross. What is your comfort zone? Do you have “dreams” about crossing those lines? If you cross a line, you take a risk. But if it is a rather controlled step, the risk is limited. The end result might be amazing. We will only be able to invent new things, to think out better solutions, by challenging ourselves. Trial and error is part of that journey. Better sorry, than safe, but please don’t forget to say sorry when something goes wrong and learn from it! » Entrepreneurship, Life thoughts, Post » Better sorry than safe!